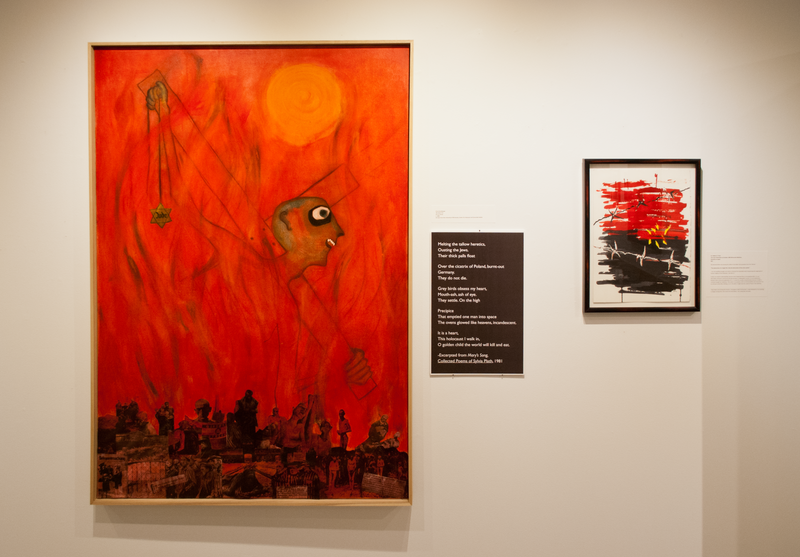 Shendar described Hirschberger as an artist of strong conviction, who painted in response to his experiences and his later historical research into the events of the Holocaust. Hirschberger was a Jew born to Jewish parents in Dresden, whose personal narrative during the Holocaust included forced expulsion, imprisonment in the Soviet Gulag, and military service fighting against the Nazi army. Hirschberger’s personal tragedies and losses led to further historical research, all of which played a role in painting on the subject. His first Holocaust series is called “Sur-Rational,” precisely because the magnitude of the events of the Holocaust seemed to exist outside of rational explanation. 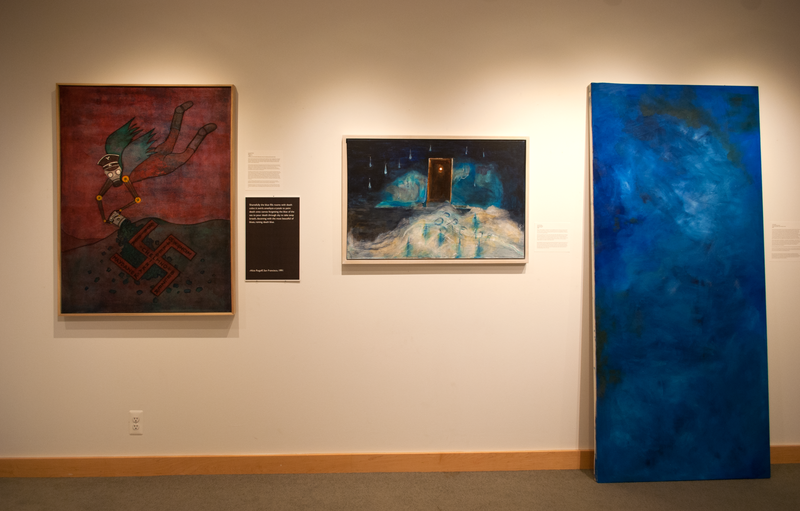 Like many artists responding to the Holocaust, Hirschberger uses religious imagery to further provoke the idea that the Holocaust, a human atrocity, transcends what a human can understand (such as in the “Fifth Horseman,” and “The Same Fire”). This is the cognitive dissonance of Hirschberger’s paintings: they attempt to convey something that evades rational comprehension, and are objects that display the physical crime of the Holocaust. 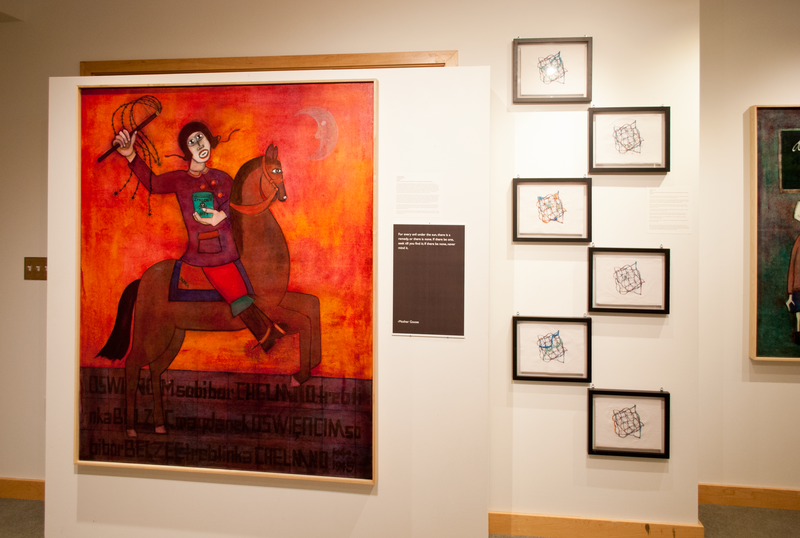 In the corner of the Horseman’s saddle, Hirschberger painted the clearly legible word “Dora,” the name of the labor camp in which his father died. 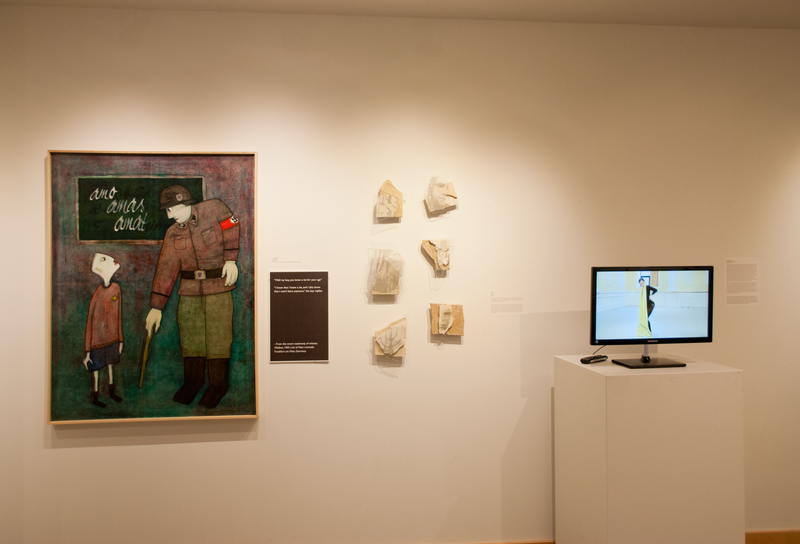 In the words of Stephen Feinstein, Hirschberger’s work attempts to “bequeath [this] knowledge and visual representation to another generation.” Hirschberger uses concrete historical references to strike an uneasy balance between the incomprehensible magnitude of the Holocaust and the real need to explain, communicate, and teach a historical event. 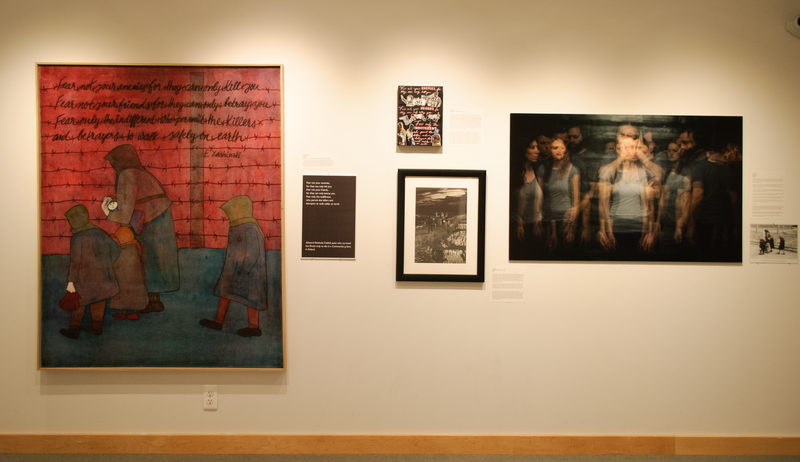 Besides occasional words painted on the canvas, many of his paintings directly reference poetry or other texts that drive lessons and morals home to the viewer (such as “Indifference”). Some of these texts are well-known, but when juxtaposed against the disjointed and naive figures in Hirschberger’s canvases, contribute to a sense of alienation from history. [Re]Telling showcases this process of handing-down visual representation to another generation by asking local artists and teens to create work in response to his chosen poetry or visuals. 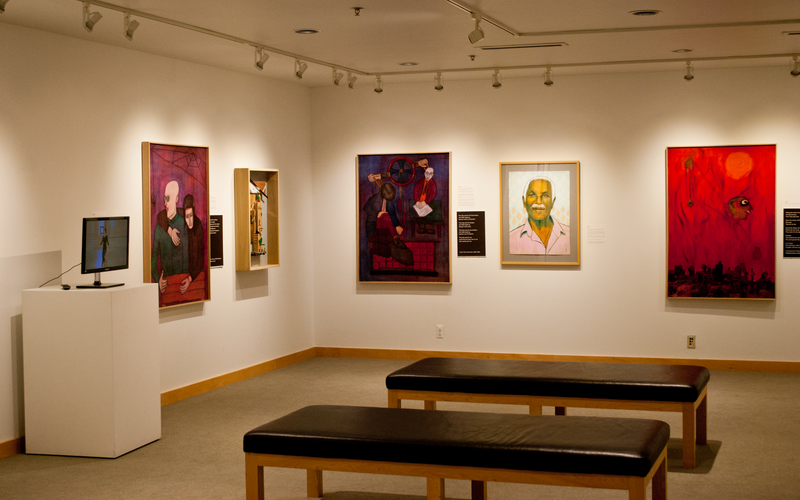 In the Tychman Shapiro Gallery, each Hirschberger painting is installed with the works of eleven local artists. 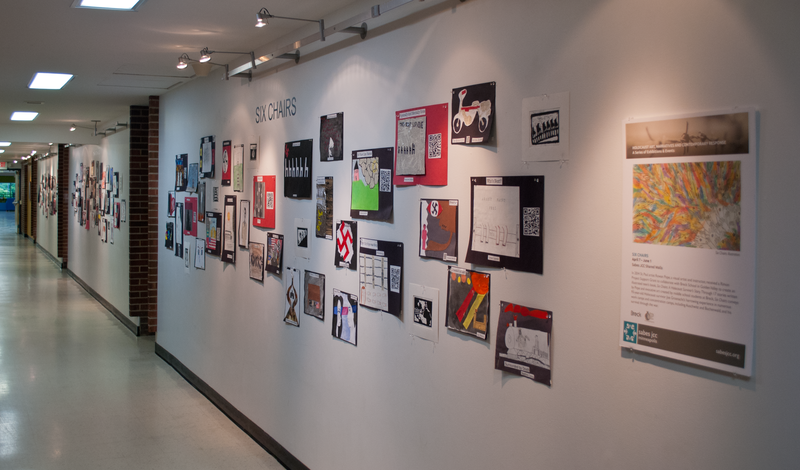 Some of the artists made art in response to the literature that Hirschberger himself selected, or were directly inspired by his paintings or their themes and subject matter. 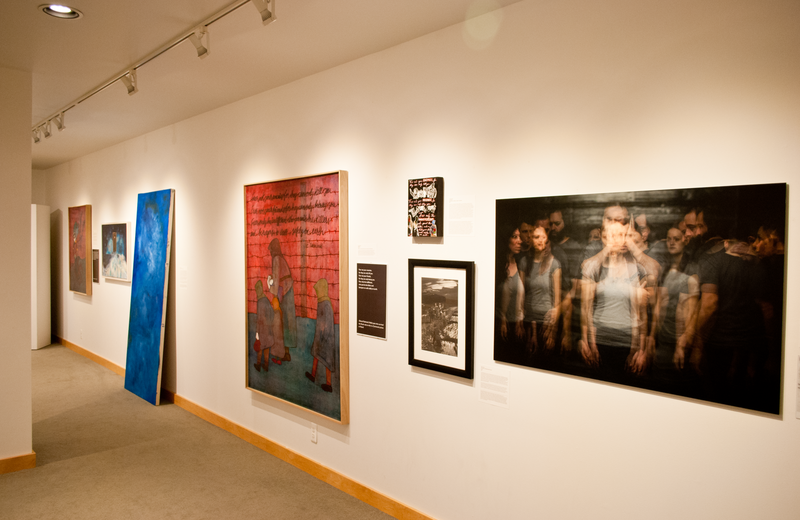 In a later post, we will look at these artists’ work in juxtaposition with Hirschberger’s own. This reflective artistic transmission represented the process of carrying personal narratives forward through generations. 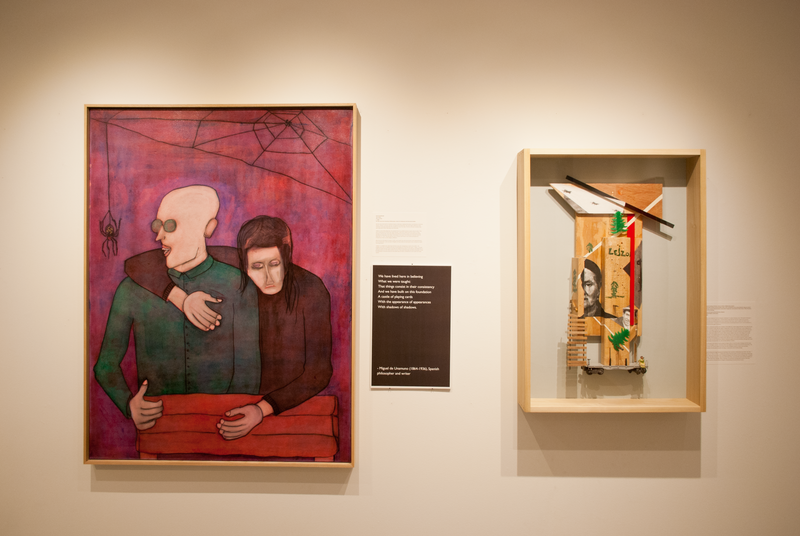 No artist replicated Hirschberger’s work, but each valued his testimony through the lens of their own expression. Shendar referred to this reflective process in her remarks, asserting that the past has meaning only when carried forward into the future. At its core, [Re]Telling shows how we give the past meaning, in this case in an artistic process. In CHGS’ 20th year, this is an appropriate recognition of CHGS’ legacy, and a visible reminder of our mission to further the study of genocide through remembrance, responsibility, and progress. 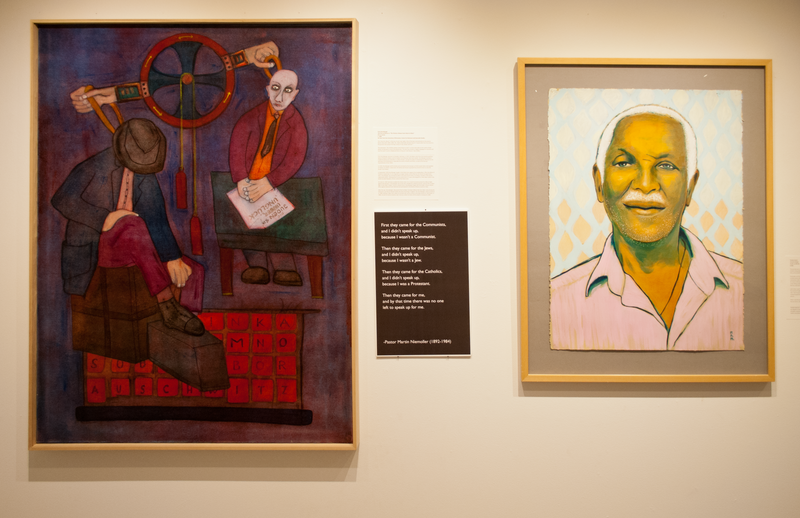 [Re]Telling was presented by CHGS and the Sabes Jewish Community Center, made possible with support from the Arsham and Charlotte Ohanessian Endowment Fund for Justice and Peace Studies of the Minneapolis Foundation, and the Howard B. 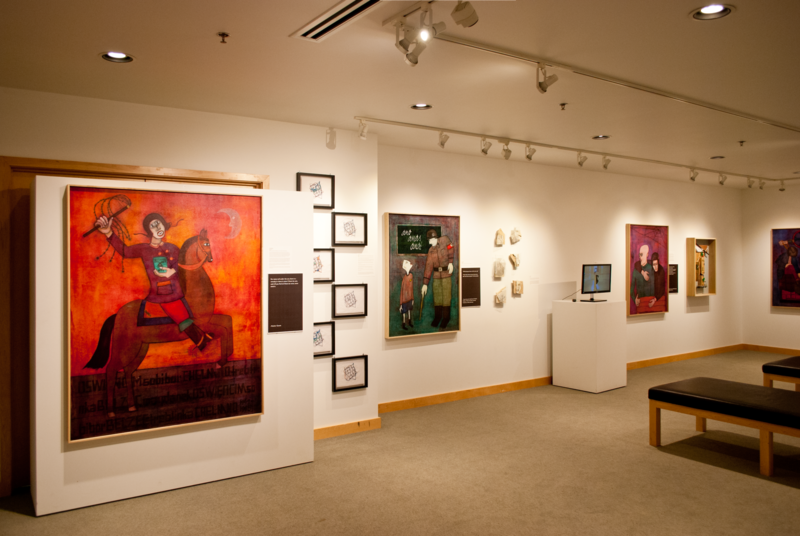 & Ruth F. Brin Jewish Arts Endowment, a fund of the Minneapolis Jewish Federation’s Foundation. 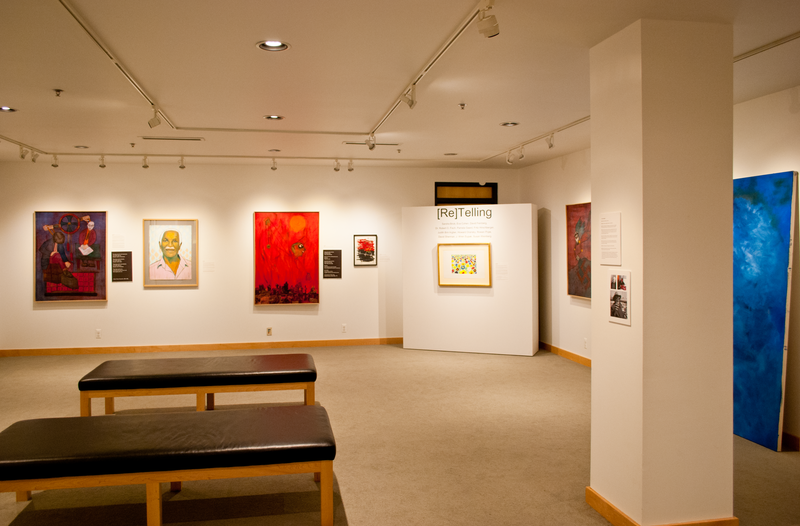 Please explore these images of the exhibition that continue the life of this art beyond the physical exhibition, and check out CHGS’ entire collection, including past exhibitions. Artwork from “Six Chairs” produced by middle-school students in the Breck School with their teacher, artist Rowan Pope. This project was published in a book of the same name.